The glowing results of Biologique Recherche - now available in Canada! Devoted fans who have been counting on online retailers and foreign trips to get their Biologique Recherche fix will be thrilled to know that it is now available in Canada! and The Treatment Stage - products containing the highest concentrations of active ingredients are applied to recondition the epidermis and help activate both its regenerative properties and those of the skin's deeper structures. The experience will be unlike any facial you've ever had (they actually don't even call it a facial, it's a Personalized Treatment) - it's not the usual cleanse, steam, extract, mask kind of deal. They use pure, concentrated, raw ingredients that are applied in a very tactile way. I have to admit that several times during the treatment I wondered what the hell was being done to my face, there was poking, prodding and strange flicking along with the more traditional massaging and during the whole thing there was almost never a time when she didn't have a least one hand on my face - it a very touchy experience! The most usual aspect of it though is that it's all done cold - no steaming, no hot towels, no warm or hot water of any kind! So tepid water, cold towels, lots of touching and holy crap, by the end of it my skin was glowing - even the lines in my decollete which I had resigned myself to being a permanent fixture were gone! 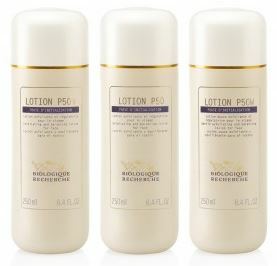 It's also easy to have the Biologique Recherche experience at home with a choice of over 100 facial products - this is where the facial came in handy as they will also recommend your at-home products - my favourite is the - Lotion P50 - 50ml - $28, 150ml - $66, 250ml - $102.50 - which gently exfoliates the skin, regulates excessive sebum secretion, moisturizes and helps maintain the epidermis' acid pH. Using it you can experience slight tingling, redness and blemishes - but what the bottle should warn you about is that is smells weird - kind of sour almost - but you can't argue with the results - it makes my skin feel so smooth and soft! Great for everyone as it comes in normal/oily, normal/dry and sensitive skin options. You can have a facial and see the line for yourself at One2One Studio in Toronto, Heritage Way Medical Spa in Oakville, Femme Fatale in Barrie, Kolor Twist Hair Co in Calgary, Brens Skin Care in Russell and Les Chambre Des Dames in Montreal. For more info check out www.beautynext.com. I have found that the only Biologique Recherche online seller is La Chambre des Dames. That is where I get my P50 from, if that can help anyone! I'm about to place an order of P50W from La Chambre des Dames, but I think I'd like to know about your experience shopping with this store and P50! Thanks!